Last year I found this ride was great training for Otway, lots of climbing, much of it in 22x34. 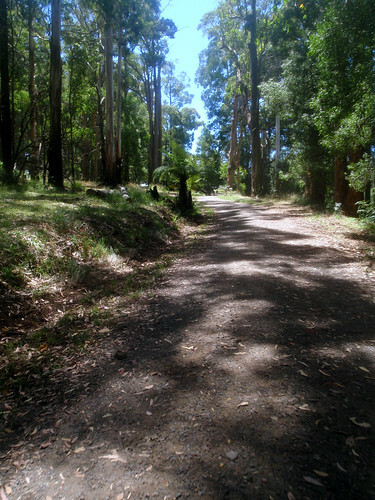 The concept is simple, circle Mt Dandenong, with 6-8 different climbs of various terrain. I was happy with how well I was able to go on the really steep stuff, holding the bike steady with the hips and concentrating on smooth power and a steady HR. Sadly it just wasn't my day in general. The heat, and most likely poor nutrition, saw me hit the wall pretty hard by the end. Watching everyone ride away from me, after being one of the stronger ones earlier, required a bit of a mental shift. All said, I'm happy to have the day in the legs, even if they (and my arms) are missing a fair bit of skin due to the overgrown single track we rode. I think those numbers are a bit low (especially distance), maybe it's time for a new battery in my HRM.